First off, to Robinson's Place Ermita. After my graveyard shift from work, I slept for a few hours and went straight to CBTL's Open House at Robinson's. Their Open House was only good from 10AM till 12NN. 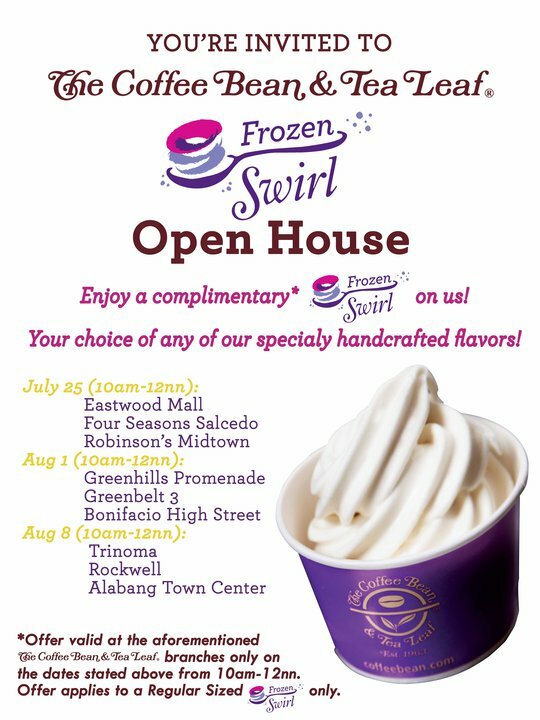 It was too early, but I mustered to go early to taste their frozen swirls for FREE! (I'm such a sucker for freebies). I met-up with Joel at CBTL. I wanted him to go so I could taste at least two variands of the frozen swirl (I was too shy to ask for more, not to be pegged as a glutton). I tried their Original Flavor and I had Joel try their Affogato. It is a must for me to try the original one first, so I could savor the true taste of soft served yogurt. I was not dissappointed. The yogurty flavor was evident, that I liked it much. The texture was icey popsicle like, but still smooth and a bit creamy. 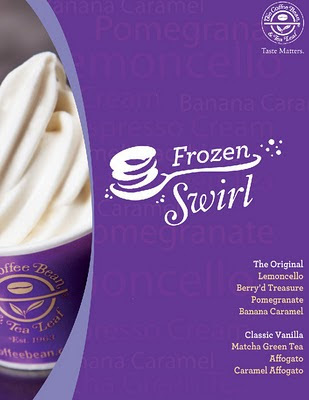 (remembering my first taste of froyo at California berry). I eagerly tasted the Affogato, and was stunned on how weird (but in a good way) it tasted. Joel seemed to like the taste because the sour taste of the yogurt was balanced with the coffee. I hate stolen shots, especially when I'm eating. Good thing I didn't laugh while eating a spoonful..
CBTL was fullhouse when we got there, so we settled at the al freso area (though I didn't like staying there because of the cigarette smell) since there are no seats available inside. Next stop, CBTL Frozen Swirl Open House at Greenbelt 3. Good thing it was quite near Glorietta 5 (it is where our office is located, convenient huh?). Joel didn't tag along that time for he was too lazy to wake up early on a Sunday (or any day in particular). I first tried the Berry'D Treasure variant. I so loved it! I especially loved berries on my yogurt (though for some, the sourness was a bit overload). I tried to finish them slowly because I know my stomach will act up on the acidity. But no luck, I down the whole serving in a few minutes resulting to a hyperacidity attack. I got to try the Lemoncello after I ate something to ease my stomach. I was expecting an artificial lemon flavored syrup topped on the yogurt, but I was wrong (am I?, not sure). The lemon flavor was on the quite sweet syrupy side which was okay considering the sour taste of the yogurt.I wanted to try everything, but I was afraid that I could not go home if ever my stomach acidity piked up. Overall, I had fun with the Open House. I am such a food junkie that Open Houses (translation : free food) never fails to excite me.